AND, FURTHER CONTENDING THAT A COUNTRY’S VIOLATION OF WOMEN’S RIGHTS ARE PROTECTED UNDER ‘SOVEREIGNTY RIGHTS’, AND JUDICIAL ACTORS VIOLATION OF WOMEN’S RIGHTS ARE PROTECTED UNDER ‘JUDICIAL INDEPENDENCE’ …. 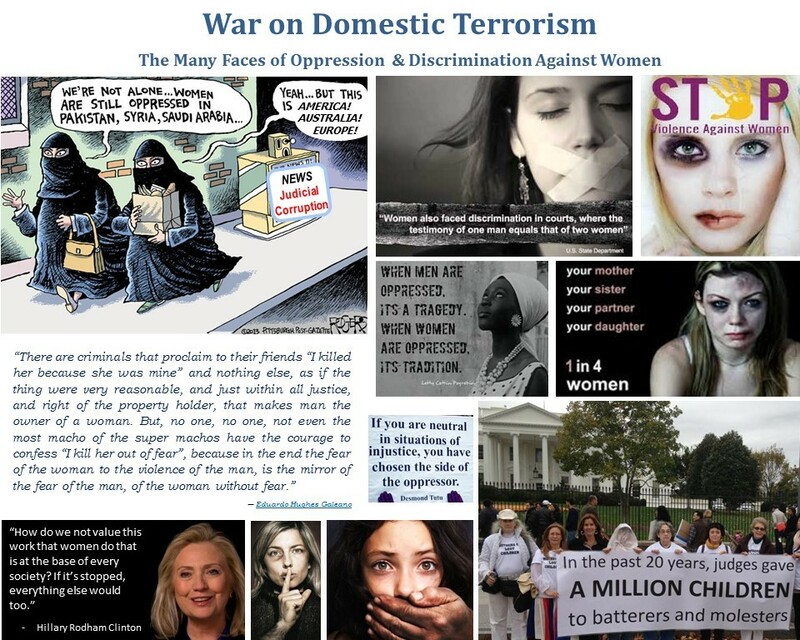 As so many advocates, I have become involved in the issues due to my own personal experience as a victim of domestic abuse, and re-victimization by the very judicial systems which have a duty and obligation under international human rights law to protect me and my children. Letter to Plehn Abogados (December2012) requesting his assistance in arriving at a financial settlement with all previous legal counsel (Gonzalo Martinez de Haro of Vanander, Carlos y Associados (American Embassy website listing); Belen Garcia Martin (Plehn Abogado – American Embassy website listing); Jose Manuel Hernandez Jiménez (abogado de oficio); Jorge Capell of Cuatrecasas, Gonçalves Pereira (American Embassy website listing); Alberto Fontes Garcia Calamarte; Miguel Martinez Lopez de Asiain & Ignacio Gonzalez Martinez; and procuradores Juan Bosco Hornedo Muguiro; Maria Pilar Lantero; Pilar Poveda Guerra; and Rafael Gamarra Megias) for their professional and criminal negligence in Wilcox vs. Gonzalez de Alcala (2007) and Gonzalez de Alcala vs. Wilcox (2007-2012); as an act of good faith and in order to avoid future litigation against them. Of additional concern, from a humanitarian as well as US government policy stand-point, has been US State Department, Consular Affairs representatives refusal to comply with my requests for assistance under the Convention of Consular Relations (art. 5, 36, 37 & 38), and as provided for in the U.S. Department of State Foreign Affairs Manual Volume 7 – Consular Affairs (FAM), inter alia. Please find enclosed a copy of pertinent correspondence with US State Department officials. To this end, I have once again contacted the American Consulate and Embassy in Madrid, as well as the Office of American Citizen Services and Crisis Management, US State Department in Washington, DC (see enclosed) requesting their assistance under the Convention of Consular Relations and FAM, inter alia. As reported by the Hague Convention Domestic Violence Project (www.haguedv.org/reports) 70% of women involved in international child abduction cases under the Hague Convention are fleeing domestic abuse and the failure of judicial systems to protect them and their children. Abbott vs. Abbott (2010) (www.supremecourt.gov/opinions/09pdf/08-645.pdf)brought these issues to the attention of the US Supreme Court. Between 2010-2012 the Office of Child’s Issues, Consular Division of the US State Department handled 890 incoming Hague Convention on international child abduction cases, with up to 70%, or 623 cases, potentially involving a protective parent fleeing domestic abuse and a Receiving State’s failure to protect. While I have been unable to obtain figures from the US State Department on the annual budget for the Office of Child’s Issues, the 2012 budget for “Strengthening Consular and Management Capabilities”was $3.75 billion. Effectively, millions of dollars per year of the Consular Affairs Division’s budget are used in supporting the abuse of thousands of Americans, while none of their resources are being used to assist the victims. Abusers are well aware of the criminal implications, and the stringent sanctions and incarceration of those who resort to international child abduction, and are freely and frequently using the Hague Convention as a tool to intimidate and abuse their victims. They do so knowing full well that not only will victims not be assisted by Receiving State’s judicial and law enforcement systems, but they will also not be assisted by Sending State’s Consulates, consular affairs division in Sending State’s headquarters, nor Sending State’s judicial system, which is plagued by the same “failure to protect” as the Receiving State. In my own case not only did my ex-husband repeatedly assure me from the onset that I would be left penniless and incarcerated (prison or psychiatric facility); claiming that all “had been planned.” At the time, I thought his contention was just another example of his schizophrenic, hallucinatory state. But, statistics and documented testimonies show that this is an increasing phenomenon amongst victims of domestic abuse. In my case, all of my assets were illegally misappropriated by the courts and the negligence of my legal counsel, and my incarceration was a very real possibility on several occasions. The culture of “laissez faire” and silencing of victims, apathy of judicial actors towards the plight of victims, failure of judicial regulatory agencies to diligently investigate complaints & sanction infractions of judicial actors, coupled with consular affairs representatives’ non-compliance with art. 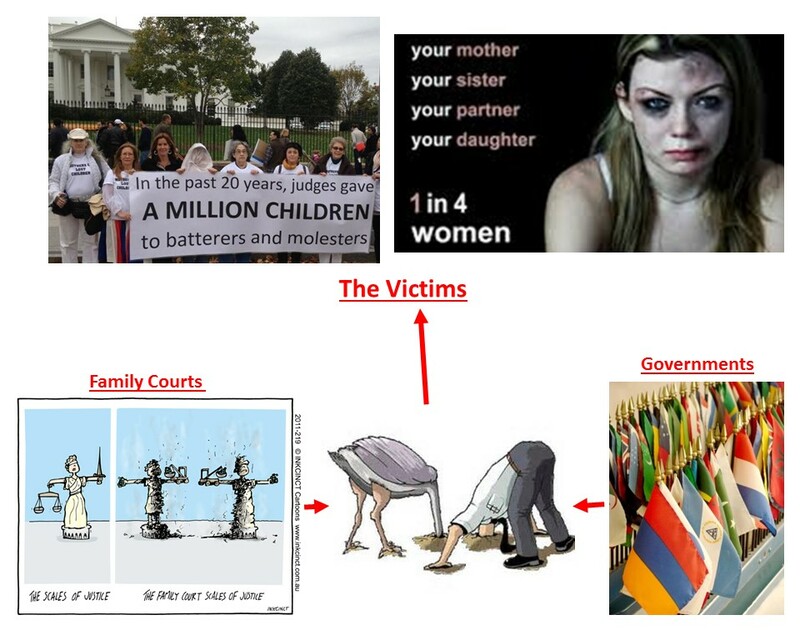 5, 36, 37 & 38 of the Convention on Consular Relations and FAM guidelines (victims of crimes/domestic abuse), inter alia, provide the motive, opportunity, and means for abusers to utilize judicial systems and government institutions to abuse their victims. The mission of Global Expats is to provide comprehensive and practical support to expatriated families around the world; keeping these families together in a productive, supportive environment for all members. It is my greatest desire to reduce the elevated number of expat marriages that end in divorce. However, this absolutely must be accomplished with an “eyes open” approach. The prevalence of domestic abuse in homes around the world, its signs and “symptoms,” it’s devastating effects on the victims and society at large, the obligation to protect all implicated parties, as well as the long-standing traditions and customs (de jure and de facto) that intentionally and unintentionally cover-up and suppress evidence of abuse and silence victims,  must be recognized, confronted, and eradicated. Global Expats Domestic Abuse Prevention Division will provide comprehensive assistance to victims of abuse, with the objective of preventing cases from reaching crisis proportions (ie. cases of international child abduction caused by efforts to protect children from abuse.) However, in order to be effective, we will require the assistance of American Consulates (as provided for in the Convention of Consular Relations) in assuring due process in foreign courts, as well as demanding accountability of State and non-State actors who violate the rights of American citizens. I hope by bringing these issues to your attention, the US State Department and American Consulates will review and reassess their present policy of non-compliance with art. 5, 36, 37 & 38 of the Convention of Consular Relations in cases of divorce, custody hearings and/or domestic abuse. The necessity for compliance with the Convention on Consular Relations by American Consulates abroad is of utmost importance in assuring that the rights of Americans are respected in judicial proceedings, as well as in their dealings with the Receiving State’s government and non-government agencies. Under Spanish law and parameters indicated on the Consejo General de Procuradores de España it appears that my procuradores were under an obligation to notify the courts and presiding judge, and/or appropriate authorities as to any irregularities, transgressions, professional negligence, or criminal activity or intent by any judicial actors, and thereby do possess a legal liability and obligation for financial damages in regards my case. Even if they were not authors of said infractions, they become accessories after the fact by their omission of action under Spanish law.